Back in May, the Centre for Science and Security Studies at King’s College London published a Crisis in South East Europe 2023 scenario for use in wargames, table-top exercises and classroom simulations (link). The scenario was designed to provide a means through which to think through the potential impact of disruptive technologies, such as missile defence, on any future integrated conflict involving NATO and Russia and, by direct implication, on strategic stability in Europe and the evolution of the wider international security environment. Importantly, the scenario also provides the basis for a more general consideration of how crises and integrated, all-domain conflict between NATO and Russia could potentially evolve in southeast Europe. The southeast Europe scenario was the second of two scenarios developed by Ivanka Barzashka for a project examining how missile defences may affect nuclear deterrence and stability in the evolving strategic environment. Project adviser Ivan Oelrich and King’s doctoral researchers Johan Elg and Marion Messmer contributed to the scenario’s intelligence reports. The project was funded by the Carnegie Corporation of New York under its initiative to explore disruptive technologies and nuclear stability. By 2023, the United States, Russia and NATO have all acknowledged a new era of strategic competition involving major powers. Global economic growth has enabled increases in defence spending and military modernisation. Six years of “America first” have produced intended results in the form of improved military readiness and morale, and new military capabilities for both the US and its allies. Russia has pursued a course consistent with its current security strategy and military doctrine and has met its stated armaments targets. NATO has continued to adapt and strengthen deterrence and defence against Russia beyond the 2016 Warsaw Summit decisions. Ukraine has continued on a pro-Western path and has modernised its military, resulting in a renewed ambition to regain control of “occupied territories”. Turkey has had an ambivalent relationship with the West: support for NATO, opposition toward specific NATO member policies and closer cooperation with Russia. New advanced conventional capabilities, cyber offence and counter-space weapons have been fielded by all sides. The US, NATO and Russia have made no major changes to nuclear capabilities beyond current plans, but the INF Treaty and New START are no longer in play. The US and NATO seek protection against Russian cruise and ballistic missile threats to Europe and make progress in deploying those capabilities. Including in the package are briefing and background materials for the United States, NATO, and Russian teams. The scenario package does not provide rules or procedures for running the scenario—that is up to you. A tiled version can be found here. Allan Shearer (School of Architecture and Centre for Sustainable Development, University of Texas at Austin) has kindly shares his report on the “Austin Archaria Experiment,” which explored the action and interaction of key local stakeholders in the context of NATO peace and stabilization mission. This discovery experiment explored potential dynamics among key host nation and international community actors who could contribute to social order in the Archaria 2035 scenario. It follows from several conversations held during the 2016 NATO Urbanisation Wargame on ways civilian stakeholders might expand or limit options for military courses of action during high intensity conflict. • That governance significantly contributes to, if not establishes the basis for, the stability of a populated area (region, nation state, city). • That governance is achieved through combinations of governmental offices, public institutions, and markets. • That successful compositions of governance (that is, combinations of government, institutions, and markets) vary due to local social and cultural factors. • That the relative importance of government offices, public institutions, and markets will change over time. • That a stable social order can include illegitimate actors who wield power beyond the rule of law. • That in times of acute stress related to unprecedented or little imagined situations, power within and among sectors of governance will be contested and may change abruptly. • That fluid conditions of governance may reduce the bases for stability and will, therefore, be a critical factor in a dynamic military operating environment. The method of the experiment followed from the RAND Corporation Research Memorandum ‘Factional Debates and National Commitments: The Multidimensional Scenario’ (1967), which sought to game how governments within a region would respond to a crisis situation for which postures or positions had not been previously stated. It assumed that a given state’s official stance would emerge through interactions among various stakeholders in or near the national government. Thirteen roles were developed for Archaria. This relatively large number reflected assumptions with regard to the fragility of the Archarian government, uncertainties about state and city government interactions in the provision of basic services, and the ability of non-governmental actors to exert influence. Each role has an assigned primary interest, a limited ability to act, and a set of connections to other roles. However, as a layer of complexity, the underlying personal values that motivate (or partially motivate) a given interest are made intentionally ambiguous through each actor’s biographical profile. As such, while it is possible to read the profiles and have an initial understanding of what each character will pursue in the near term, participants must contribute their own interpretations of the background material to round-out or complete the portrayal of a role. 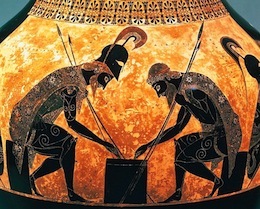 Subsequent interactive gameplay requires that these added assumptions be declared and allows for a more nuanced assessment of negotiated decisions. 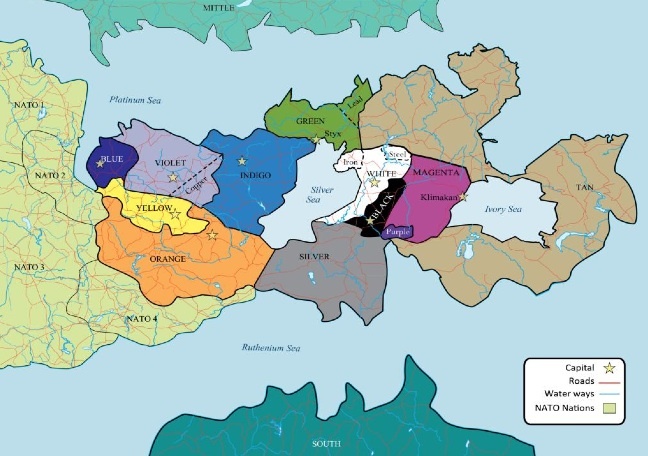 The region spanning Yorbia to Central Landia is characterized by ongoing political upheaval and economic disruptions related to globalization, migration, climate change, cyber-attacks, and transnational crime. Centrium and North Yorbia pose global problems due to the rise of extremist groups that strike around the world. 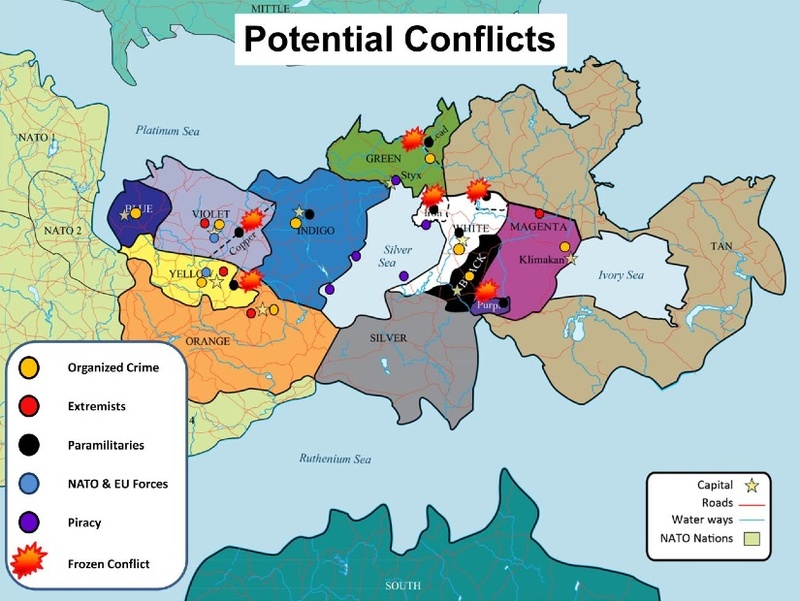 In the center of the region, relationships between Positania and Catan have significantly deteriorated over the last year due to: (1) Positania’s strengthening political ties with the Confederation of Northlandia Nations (CNN) and its efforts to join NATO, and (2) The increasing economic importance of the Port of Archaria, which is critical not only for Positania, but for global trade. These two issues are combined in escalating tensions over the control of the primary routes across the Sidonian Sea. Within Positania, people are divided over the short- and long-term bene ts of better relationships with CNN or Catan. The majority of middle- and upper-class Neapolitans see a more prosperous and independent future through partnerships with the North. Those living in crowded slums are distrustful of Catan and opposed to its aggressive posturing, but they also believe policies of the Northlandia Nations have worsened their standard of living. Ethnic Catans living in Archaria—some families for generations— feel they are not fully enfranchised citizens in Positania. Alongside state-level geopolitical maneuvers, factions and stakeholders operate at Archaria to influence the way the city functions and shape its relationships with other municipalities. May 1, 2035: United Nations’ Security Resolution 12991 condemns the Government of Catan for its failure to abide by international law and authorizes the North Atlantic Treaty Organization to deploy a response force (known as the NATO Positania Force or NPF) for an initial period of twelve months. NPF is to support the efforts of the government of Positania to ensure sovereignty and integrity of its national borders and to safeguard the freedom of navigation in the Sidonian Sea. Further, NATO is to support the creation of a safe and secure environment for the civilian led delivery of humanitarian assistance and the voluntary return of internally displaced persons and refugees. The President of Positania has offered host nation facilities to a multinational NATO force that would deploy in support of peace and stability. The NATO military instrument of power will be complemented by the political and economic instruments of power of the International Community and the significant role played by the Positania’s armed forces. The response involves achieving three objectives: (1) Military threat to Positania posed by Catan is degraded and the territorial integrity of Positania is restored. (2) Freedom of movement in South Landia, and, in particular, the Sidonian Sea is maintained. (3) Safe and Secure Environment (SASE) for humanitarian assistance is supported. TODAY—June 20, 2035: Catan forces are arrayed in defensive positions in a band along the north-south autostrada A1 from autostrada A3 in the south to highway 57 in the north. Catan forces have been unable to secure either the port or airport of Archaria; however, both are within indirect re range of Catan forces’ artillery, mortars, and air defense weapons. Catan forces have been actively patrolling and probing along their frontage and are in position to launch local attacks against lightly defended targets. Additionally, Catan is focusing its psychological warfare campaign and perception-shaping efforts against the citizens of Positania. It is maintaining that conflict in the region would not exist if it were not for the bullying and intimidation of the Confederation of Northlandia Nations and NATO allies. The message has been generally well received by governments across the region and it has inflamed the emotions of Archarian citizens of Catan descent. You’ll find the full report here (pdf). President Vladimir Putin’s Kremlin has sought to reverse the post-Cold War era transformations during which Russia lost its satellites, withdrew militarily from Central and Eastern Europe (CEE), forfeited its regional predominance, and curtailed its international power projection. Moscow’s primary strategic objective under the Putin presidency is to create a Eurasian bloc of states under predominant Russian influence that will necessitate containing, undermining and reversing NATO influence throughout eastern Europe. Even where it cannot pressure or entice its neighbours to integrate in the Eurasian Economic Union (EEU) and the Collective Security Treaty Organization (CSTO), the Kremlin attempts to neutralize nearby capitals by preventing them from moving into Western institutions, particularly NATO and the European Union (EU). In this strategic context, Russia’s supremacy in the Black Sea becomes critical for restoring its east European and Eurasian dominion, as well as projecting power toward the Mediterranean and Middle East. Its offensives in and around the Black Sea are part of a larger anti-NATO strategy in which naval forces play a significant and growing role. Russia is using the Black Sea as a more advantageous method of revisionism than extensive land conquests. Control of ports and sea lanes delivers several benefits: it prevents NATO from projecting sufficient security for its Black Sea members; deters the intervention of littoral states on behalf of vulnerable neighbours; threatens to choke the trade and energy routes of states not in compliance with Russia’s national ambitions; and gives Moscow an enhanced ability to exploit fossil fuels in maritime locations. All of this assumes particular significance, of course, against the backdrop of Russian deployment of its (rather dilapitated) aircraft carrier Admiral Kuznetsov to support combat operations in Syria, reports that NATO is again playing hide-and-seek with Russian attack submarines in the Med (and vice-versa), continued conflict in the Ukraine, political uncertainty in Turkey, the regional migrant crisis, and the growing value of eastern Mediterranean oil and gas deposits. The actors represented in the game include the US, Turkey, Russia, Ukraine, Cyprus, and the UK, and turns represent around 2-4 weeks. Rules, counters, and maps are included, and can be downloaded from here (pdf). The wargame utilized personnel from 18 member countries, dividing them into four brigade teams, each of which worked a MEB-level problem set placed in a 2035, smart city, of 5.7 million people. The wargame addressed offensive, defensive, stability, and expeditionary activities using three vignettes; joint forcible entry into an urban area, offensive and defensive actions to defeat an enemy in an urban area, and transition to host nation government. The brigade teams analyzed proposed 2035 capabilities, and discovered new ones, by fighting each vignette twice – first as today’s force against a 2035 enemy, and then again with 2035 capabilities. While the wargame would have identified capability requirements and gaps, the presence of Marines proved instrumental in maximizing the event’s potential. This presence, to include a substantial number of practitioners from the Operating Forces, allowed the Marine Corps to fully exploit the game and develop a draft operating concept for the urban environment that will nest under the Marine Operating Concept and join the rest of the Marine Corps family of operating concepts…. You’ll find Scott’s full unclassified “first impressions” report here (pdf). More information on the wargame can be found at the website of the NATO Modelling and Simulation Centre of Excellence, while broader background information on NATO’s current urbanization project can be found at the NATO ACT website. Some recent items on conflict simulation and serious (and not-so-serious) gaming that may be of interest to PAXsims readers. Ryan Kuhns contributed to this latest edition. The East China Sea is one of the most contested regions in the existing geopolitical climate. A small body of water, whose mass is dwarfed by the world’s oceans, the East China Sea is hotly divided, with overlapping claims by four different regional actors: Japan, China, Taiwan, and South Korea. Though the exact territorial claims vary from state to state, all actors have held firm in their demands, and recent aggressive expansionism has once more brought the East China Sea to the forefront of geopolitical focus. This tension is fueled by the immense strategic and economic value of the region: the East China Sea is home to an abundance of marine life, rich fishing grounds, vast natural gas reserves, and several highly strategic trade arteries, all of which are integral to the economies to the surrounding regional actors. These attributes combine to make the East China Sea one of the most economically valuable, and strategically advantageous, oceanic regions in the world. This simulation will examine the complex maze that actors must negotiate when dealing with the tense social, political, and military dilemmas currently occurring in the East China Sea. Participants will assume the roles of influential policymakers, and must work with both state and non-state regional actors to execute comprehensive and multilateral government responses to issues ranging from great power politics, piracy, and natural resource conflicts; to state bargaining dilemmas, humanitarian assistance, and collective action problems. Participants will have the unique opportunity to grapple with serious questions of national interest through the eyes of the government of the United States and the People’s Republic of China as they are divided into teams in order to develop their respective policies and agendas. Participants will need to develop strategies in line with their team’s objectives to manage a variety of crises and react to actions from other teams. Whether through the Politburo or the National Security Council; the Pentagon or Central Military Commission; the Ministry of State Security or the Central Intelligence Agency; participants will be challenged to work together to develop policy solutions for the complex myriad of issues that will determine the fate of the East China Sea. The new and challenging environment that confronts UN peace operations, including asymmetrical warfare, terrorist operations, drone surveillance, and organized crime. The planning and implementation of modern peace operations, including the roles played by the Security Council, NATO, EU, AU, troop contributing countries and the United States. The key issues confronting UN peacekeeping and the recommendations of the High Level Panel’s Report and the Presidential Summit for going forward. The planning of a peace operation through interactive role play with a diverse group of well-informed fellow professionals. The course includes a simulation/role-play exercise on planning for a fictional UN Mission in Equatorial Kundu (UNIMEK). More information is available at the link above. After the earthquake that devastated the capital, aid was slow to reach the slums of District 3. Poor coordination resulted in duplication of effort in some areas, and shortages of essential aid supplies in others. The port and airport remained severely damaged, creating transportation bottlenecks. The latest reports suggested a cholera outbreak too. It was no surprise that social unrest was growing. The vignette above is drawn from AFTERSHOCK: A Humanitarian Crisis Game. AFTERSHOCK was developed for classroom use to highlight the challenges of multilateral coordination in the context of a natural disasters or complex humanitarian emergencies. The game has spread well beyond its initial use at McGill University, and has been taken adopted for professional training of aid workers, peacekeeping personnel, and military officers. This article briefly describes the genesis of the project, the development and production of the game, and some thoughts about using it in the classroom. You read the whole thing here. That was the question posed to 28 students from leading European Universities from throughout Europe, including Cork, Dublin, Bath, Lisbon, Palermo, Istanbul and Pavia, as well as the European University Institute in Florence, in a realistic re-enactment of a NAC session. 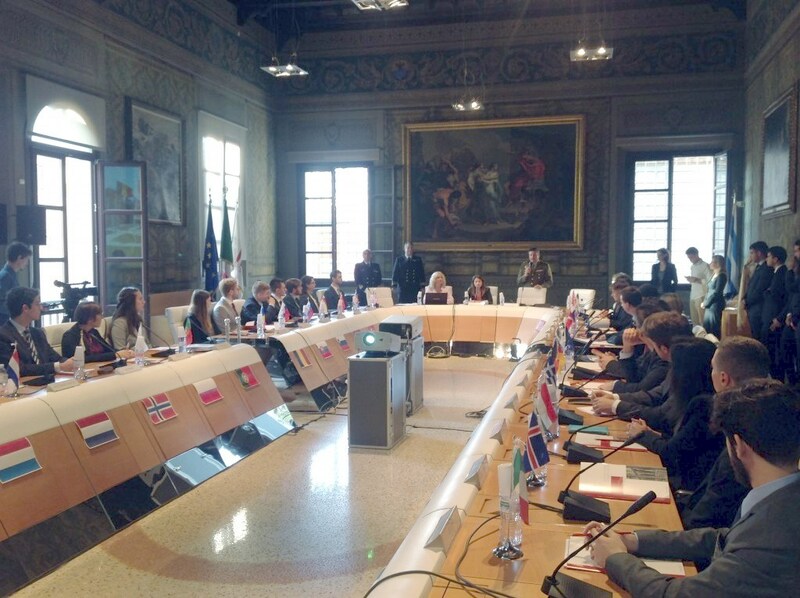 Based on the Memorandum of Understanding with NATO, the University of Bologna, School of Political Sciences, hosted the 9th North Atlantic Council Simulation (NATO Model Event) in Forli, Italy, 8-9 October 2015. During the NAC simulation, the students explored, discussed and seek resolution to a fictitious scenario, led by Lieutenant Colonel Alfonso Alvarez, Commander Matteo Minelli and supported by Ms Tracey Cheasley, Mr Nicola Nasuti, Ms Cristina Siserman from Allied Command Transformation Strategic Plans & Policy Branch (ACT SPP) and Lieutenant Commander Dave Jones from ACT StratCom. As an evaluation, the students participating to the event stressed that the realism of the discussions, decision-making and eventual consensus on actions, cannot be overstated and that they are very glad to be able to take part in this simulation. Finally, Lieutenant Colonel Alvarez mentioned his gratitude to return to the University of Bologna to stage the NATO Model Event this year.”The Sala del Consiglio, Fondazione Cassa Dei Risparmi Di Forli is a perfect venue for the event and we are welcomed here with most gracious hospitality. It is a real honour to showcase our NAC simulation here at the university with such enthusiastic and well-prepared students.” he added. As part of SACT’s Educational Outreach programme, NATO Model Events are held in Turkey, Italy and the USA throughout the year to help students and faculty members learn more about NATO and to understand more about the countries that they represent and that make up the Alliance. A recent article by Quintin Smith in The Guardian highlights those aspects of the boardgaming experience that digital games cannot truly replicate. Surely there’s nothing a board game can do that a video game can’t do better, right? After all, board games are so limited. You have to fit them on a table, and make them out of real, tangible stuff. Video games can do whatever you can imagine! And the best video games should already be stealing from board games. I think game designers ought to be out-and-out burglars, pausing their larceny only to remix and rethink the latest haul of ideas. But there are also things that make board and card games great that can’t be stolen. At least, not yet. Those elements that exist only within the sphere of real-life cards, smiles and dining room tables. Even in virtual worlds, life is what you make of it. A study has found that gamers have more fun when they think a video game has been updated with fancy new features – even when that’s not true. Paul Cairns, a professor of human-computer interaction at the University of York, UK, wondered if the placebo effect translates into the world of video games after watching a TV programme about how a sugar pill had improved cyclists’ performance. To test their idea, he and colleague Alena Denisova asked 21 people to play two rounds of Don’t Starve, an adventure game in which the player must collect objects using a map in order to survive. In the first round, the researchers told the players that the map would be randomly generated. In the second, they said it would be controlled by an “adaptive AI” that could change the map based on the player’s skill level. After each round, the players filled out a survey. In fact, neither game used AI – both versions of the game were identically random. But when players thought that they were playing with AI, they rated the game as more immersive and more entertaining. Some thought the game was harder with AI, others found it easier – but no one found it equally challenging. “The adaptive AI put me in a safer environment and seemed to present me with resources as needed,” said one player. “It reduces the time of exploring the map, which makes the game more enjoyable,” said another. A different experimental design, with 40 new subjects, confirmed the effect. This time, half of the players were put in a control group and told that the game was random, while the other half thought the game had built-in AI…. …except that it was actually imagery from the 2010 video game Apache: Air Assault. If you want to join Dave and Kelsey and the gang, now’s the time — the first call for writers we’ve put out since 2012. We’re looking for reviewers to do 2 to 3 (paid!) reviews per month. We’re also looking for another news writer, somebody who can write funny, insightful news posts most weekdays — also a paid gig. You’ll find more on how to apply here. I am in Brussels and have been invited back to the troubled island of Raleigh by NATO and will be facilitating one of the syndicates over the next few days, more from the mid-Atlantic, Internet permitting. Drew Hamilton has reviewd Phil Sabin’s recent book Simulating War at Times Higher Education. It is good to see the book getting notice outside the wargaming community, since it has much to offer to both teachers and historians. Robert Hossal—a student in Phil’s conflict simulation course at King’s College London—has finished his class assignment/wargame of the 2007 Baghdad security plan, Fardh al-Qanoon. 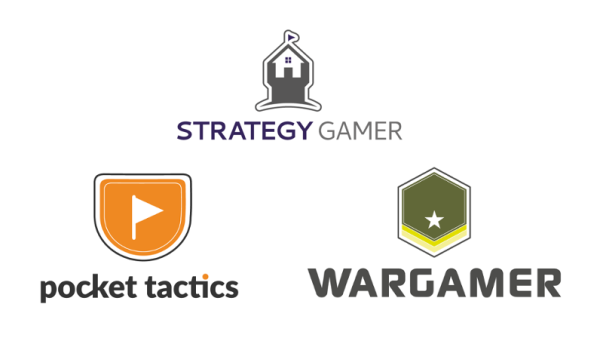 You’ll find both the game and his reflections on the design process over at his Smart War blog. Strategy & Tactics Press will be launching a new war-game magazine on the modern era, Modern War, in June. There’s been loads of excellent discussion lately at both the Simulating War Yahoo group, and over at the Wargaming Connection website. Earlier this month, Catalysts for Change—a “48-hour online game to engage people around the world to reimagine the future of poverty and global well-being”—was held. The game (which is more of a crowd-sourcing/social media tool) was produced using the Foresight Engine platform designed by Jane McGonigal and developed by Institute for the Future (it all looks very MMOWGLI-like). I’m afraid that I was rather underwhelmed by the general quality of the discussion. Measuring the impact on social engagement is a a trickier issue, though—do initiatives like this lead to social activism, or digital slacktivism? NATO recently released its first serious training game app for mobile devices, an Android version of Boarders Ahoy! The game is designed to improve maritime interdiction skills, or more precisely boarding and search procedures. You can read about the game’s development on the Caspian Learning website, and the game itself can be downloaded from the Google Play marketplace. Lest anyone think we spent our whole time in Tallinn designing card games and hunting down local game stores, I thought I would offer an after action review of sorts of the recent NATO “Countering Hybrid Threats” conference. Given our focus here at PAXsims, I’ll primarily discuss the scenario-based experiment method that was adopted by the organizers, and its advantages and disadvantages compared with a more usual conference format. However, I’ll also offer some of my own take-away thoughts on what the five days of discussion suggested to me about NATO and the CHT issue. One of the challenges in offering reflections on the process, of course, is that I came to the experiment as an interested participant but not as a client. As a consequence, I’m only a limited position to judge the institutional and conceptual needs of the organizers, and how the experiment outputs might play into both that and the broader politics of the NATO alliance. NATO ACT folks reading this post may well find it rather under-informed. Those who don’t follow alliance politics and doctrinal debate may find it confusing and complicated. If you’ve come to this page interested in CHT issues but not the scenario methodology, you can skip ahead to my “other observations” towards the end of this blog post. The concept of hybrid threats has been increasingly used in military discussion in recent years, although not without a degree of confusion and controversy. NATO has defined a hybrid threat as one “posed by adversaries, with the ability to simultaneously employ conventional and non-conventional means adaptively in pursuit of their objectives.” Insurgent groups, for example, might not only use firearms and improvised explosive devices but also cyberhacking of government websites and local social welfare programs to win support from local populations. A criminal syndicate might use both armed violence and corruption. A state might pursue its objectives both through regular military means and open or covert alliances with criminal, political, and insurgent groups. The main criticism of hybrid warfare would be that warfare has always been hybrid, involving not only military tools but also information operations and propaganda, economic pressures, alliances with nonstate actors, and so forth. In this view, hybrid threats and hybrid warfare are at best trendy jargon, and at worst a distraction from more important issues and challenges. Treating the debate over hybrid warfare solely as an issue of definitional exactitude and conceptual utility misses much of what is going on, however. Clearly, Western militaries have found themselves doing all sorts of things in the post-Cold War era, things that are very different from the large-scale force-on-force warfare that they were designed for. This is especially true for the NATO alliance, built to deter a Soviet attack, or defend against such an attack if deterrence failed. In practice NATO has found itself involved first in complex operations in the Balkans in the 1990s (humanitarian protection, punitive strikes, and stabilization in Bosnia and later Kosovo), in COIN in Afghanistan since 2001, in anti-pirate operations, and now in the current intervention in civil war in Libya. The notion of hybrid threats is therefore also an attempt to help the alliance prepare for the likely diversity of future engagements. The notion of hybrid threats combines the element that NATO is comfortable with (conventional warfare) with those things with which it is less comfortable. It thus seems to serve as something of a sugar-coating to facilitate a shift of focus, and as a terminological lever intended to open up issues of preparation, training, capacity, analysis, and necessary partnerships for 21st century security challenges. Further complicating matters, the debate over the “military contribution to countering hybrid threats” overlaps with several other simultaneous debates within NATO, such as the need to develop a “comprehensive approach” to security problems, as well as identification of emerging security challenges. Not all member states fully agree in these two areas either. In the former case, there are differences over what NATO (as opposed to other actors) should do, and whether new capabilities are needed. In the latter case, your sense of threat is rather different if you are large or small, adjacent to Russia, located in the Mediterranean, or far away in North America. Overlaying all of this are the additional complexities of potential synergy and potential competition between NATO and the EU (not to mention the differences among European states towards both institutions). At this point, one thing should be clear: why after 5 days of discussion in Tallinn we invented Jargon Wars. It was either that, or some kind of game involving Powerpoint. The recent Tallinn conference “experiment” was intended to explore all of this. Specifically, it sought to “investigate the utility and feasibility of the CHT concept and develop with both military and civilian actors an understanding of potential NATO approaches in addressing the identified key challenge areas.” To do this, participants were provided with details of a fictional “Silver and Ivory Seas” region bordering Europe in the year 2016. Participants for the experiment were chosen from a wide variety of civilian (humanitarian, aid, business, technology, academics), government (police, diplomatic), and military backgrounds. Clear emphasis was placed on civilian and non-military participants, who comprised a clear majority of the 75 or so persons who formed the membership of three different panels. These panels were each teamed with senior advisors, as well as NATO ACT facilitators who worked hard to keep discussions focussed on a roadmap of questions and issues to be addressed. The experiment was nota simulation or wargame, however. While a scene-setting “World News Network” video was presented at the outset, there was no scope for taking decisions or initiating actions in the fictional universe. There was no change in environmental or situational conditions as the experiment progressed. Participants each had particular subject matter expertise, but were not expected to role-play this in anyway (although one former American diplomat who shall remain nameless did an outstanding job of representing Blackland’s rather dubious interests). While the region contained a representative sampling of current and emerging real-world security problems, and the history of the area (“the break-up of the regional hegemon in the 1990s and the subsequent ethnic and religious wars resulted in the creation of a multitude of smaller nation-states”) was clearly reminiscent of the Balkans and Caucasus, fictional countries were not strongly modelled on particular real-world cases. The earlier planning documents for the experiment suggests that at first the scenario design was intended as a closer fit to NATO’s real geostrategic position and the characteristics of its specific neighbours, but I imagine that would have been far too politically sensitive to undertake, especially in a city a mere 200km away from the Russian border. (Picture, right: the representative of Blackland contemplates how best to foil the “International Friends Group” for the Silver and Ivory Seas.) By pushing the scenario out to the near future, the organizers could also suggest the heightening of such emerging threats as cybercrime and smuggled nuclear materials. Periodically the three different working groups (or panels) met in plenary to share insights, and at the end there was a brief-back and overall discussion with a number of senior NATO guests in attendance. Inevitably, when one is given a fictional scenario participants quickly finds gaps or material missing—and yet the more material that is provided, the more overwhelmingly it can all be. It is a difficult balancing act. In the case of the Silver and Ivory Seas, we were provided with background on the dozen or so states of the region, various contested regions and contested borders, paramilitary and extremist groups, and criminal syndicates in the area; additional description of the international context and the Silver and Ivory Seas Association; and a directive from the NATO North Atlantic Council on the situation—all of it running to more than 41+ pages of information. There were some strange omissions (we had detailed information on the size of each country’s labour force, for example but not its total population; there was no substantial information on relative military capabilities; and there was no scale to the map). In particular there was strikingly little information on local political dynamics, beyond a vague description of the national political system in each case. Similarly, there was virtually no information on the major ethnic and religious groups in the region, even though these cleavages were clearly major drivers of local conflict. On the other hand, it was a lot to handle, and for the first few days there was considerable and obvious confusion among many in the groups as to who was who, and who was doing what to whom in the region. Adding additional length and complexity to the briefing materials would have only aggravated this. Overall, therefore, I think the experiment design team got the total volume of information about right. I do think, however, that they could have cut the number of countries in half, and added twice as much information on each, including a much more detailed assessment of political, governmental, and social conditions. The audience mix was excellent, in terms of the depth and range of experiences and expertise represented. This diversity clearly enhanced the quality of the discussions. Ironically, despite the experiment location there was surprisingly little discussion of Estonia’s own remarkable transition from Soviet-occupied satellite and $2000 GDP/capita command economy to vibrant, democratic member of the European Union. A few Estonian politicians, economists, civil society actors, minority representatives, and so forth in the room could have been quite helpful—especially given how many countries in the Silver and Ivory Seas region resembled the Baltics, Eastern Europe, and the Balkans. Once we were a day or so into the discussions within the panels, I felt the scenario did begin to work quite well as a catalyst for reflecting on the broader topics of concern. Participants (and possibly facilitators too) had learned when to use it to move issues forward, and when it was less necessary or even constraining. Comparisons with the Balkans, Afghanistan, Iraq, various UN peace operations, and other cases of conflict prevention and resolution were increasingly integrated into the discussion. Although only one “devil’s advocate” was assigned to each group, many took on that role, challenging groups to refine their thinking and address possible weaknesses and contingencies in proposed courses of action. Although not particularly related to the scenario-driven experiment methodology, there were several broader aspects of the conference that were positive too. Although I thought the very last plenary brief-back failed to capture some of the more interesting issues that had been raised in group discussions (perhaps because there were so many, or because of my own interests and biases), overall I did like the process of breaking down into smaller groups then assembling back in plenary to summarize discussions. There was lots of coffee and lots of flexible coffee breaks where side discussions and networking could occur. I’m not fond of starting at 0800 each morning, but that’s probably my own fault for doing my own work late each night. The conference staff were phenomenal. The hotel and hotel staff were excellent too. I’m not convinced that “hybrid threats” works very well as a military concept—it focuses too much on the idea of a clear and identifiable foe who is trying to hurt you, and not enough on contextual conditions, or harm done as a byproduct (rather than an intended effect) of local conflicts, which I think is often the case. I also agree that, historically, a great many threats have been hybrid, so this isn’t necessarily new. Despite my comments in #1, it may not matter if CHT meets the abstract standard of theoretical conceptual rigour. It seems to work fine as a shorthand for “all that messy, non-conventional war stuff NATO might do.” I’m not sure the alliance could agree on anything that would work any better. Ideas matter. Normative concerns matter (and indeed played important roles in driving the alliance into military operations in Bosnia, Kosovo, and now Libya.) The political and media environment in NATO countries matter. This is the unspoken “walrus in the room” in any discussion of NATO’s future, and we need to spend more time thinking about it. Goodness knows that NATO’s political masters do. I have a sneaking feeling that many national politicians have a more inclusive and integrated sense of national and security interests than do some senior military personnel. Politics is not a bad word, even if it does mess up advance planning. Unity of command is impossible to achieve in complex peace and stabilization operations. Indeed, efforts to achieve it likely alienate important partners, and can be the very antithesis of partnership. Instead, one needs to strive for a modus vivendi that works, even if imperfectly. The “next” NATO operation is unknowable. No one would have predicted NATO’s involvement in Bosnia or Kosovo in 1987. No one would have predicted NATO’s operations in Afghanistan in 2000. Certainly no one—and I mean literally no one, of the 7 billion people on the planet—would have predicted NATO operations in Libya in November 2010. NATO has never in its history entered into a conflict as a matter of measured advanced planning. Rather it has fallen into them sideward, driven by unstable conditions and shifting politics. Much as it might want to be the “George C. Scott-as-Patton” of international alliances, its actual path to military engagement rather more resembles a Jim Carey comedy. There’s no point bemoaning this, moreover—it is probably unavoidable. Consequently, NATO needs to prepare against a very broad spectrum of things, rather than a particular thing. The flexibility of the CHT concept might actually be quite useful here, regardless of whatever quibbles one can raise about it. Afghanistan, Libya, and the Balkans can inform reflections, but they shouldn’t drive them. How likely is it that NATO would be doing industrial-strength COIN (Afghanistan-style) any time soon? The broader COINdinsita vs COINtra debate was largely absent from the Tallinn meeting. It shouldn’t have been, since not everyone is convinced that the primary contemporary COIN emphasis on non-kinetic elements is appropriate. Heretics and iconoclasts can be useful people to have in a room. Because of #6, NATO also needs to think more about changing the way it works and develops relationships rather than focussing on material capabilities. It needs to have established, rich, and enduring interactions with a range of actors so that when a crisis occurs it has both a network of contacts and a degree of pre-established trust and understanding. It needs to strategize how it develops and sustains relationships. I think the experiment made major contributions in this respect. One needs to be careful of the top-down/command-and-control/campaign plan style of problem-solving. Some of the discussions in Tallinn seemed to imply that peacebuilding is like making a cake, with the cook or cooks deciding on the appropriate mix of steps and ingredients to “counter the cake problem.” This in turn led to a lot of discussion of how many cooks there should be, how they should decide on a CHT recipe, who brings the eggs, and so forth. However, in the real world of stabilization operations these are self-mixing cakes with minds of their own. Some of the ingredients hate some of the others. Some change as you stir. Sometimes stirring makes things worse if you aren’t careful. Indeed, occasionally the cake batter tries to kill you. We need to be appropriately humble about how much true understanding and leverage we have. On the subject of self-mixing cakes, never underestimate the ability of the locals to manipulate the outsiders. Increasingly from 1993 onwards, NATO became a military adjunct to Bosnia’s efforts to secure independence. In 1999, NATO found itself acting as the air force of the Kosovo Liberation Army (admitted largely due to Serbian miscalculations). In 2011, NATO is providing air cover for the Transitional National Council’s regime change efforts in Libya. I supported all three operations, so this isn’t a critique—rather, it underlines once again that the locals get a vote too. Lots of people have been doing (or trying to do) conflict prevention and stabilization a very long time, and usually doing it without any NATO presence. Don’t reinvent the wheel, but rather think partnership. In many cases NATO could be a very junior partner. Things can be made better, but the perfect can be the enemy of the good. A sort of cynical optimism is therefore important. Hubris is fatal (sometimes literally so). Be aware of the law of diminishing returns, and know when something is a “good enough” solution and we should move on to the next problem. Perhaps because they’re locked together in small steel cylinders for long periods of time, submariners can really tell jokes wickedly well.